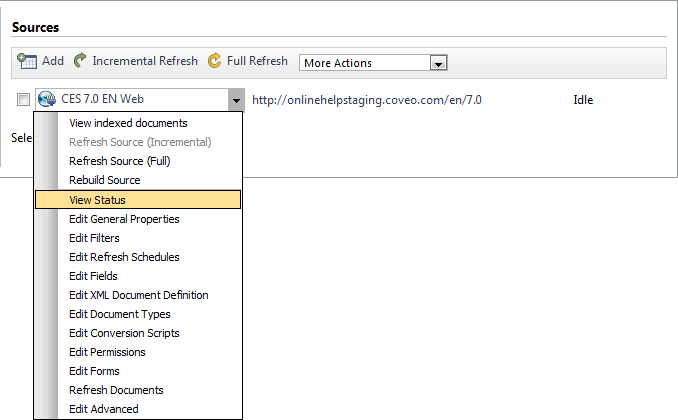 Administrator Help > Coveo Enterprise Search 7.0 > Administration Tool > Index Tab > Sources and Collections Menu > What Information Is Displayed in the Status Page? In the Administration Tool, the Status page for a source displays general information concerning the content of a source and actions performed on it. In the Sources section, expand the appropriate source drop-down list. The following table describes the content of the sections in the Status page. Displays the status of the source (see What Are the Possible Statuses of a Source?). Displays the addresses at which the connector begins the crawling process. Displays the number of documents contained in the source as well as their total size (see Administration Tool - Index Content Menu). Click [Details] to review the content of this source in the Index Browser (see Reviewing Document Details from the Index Browser). Displays the duration as well as starting and ending date/time for the last operation performed on the source (i.e. indexing, refreshing or rebuilding) . Click [Details] to access the Index page showing the logs for this source (see What Information Is Displayed in the Index Log?). Displays documents crawled during the most recent or current operation according to the type and subtype of action taken. Click [Details] to access the Index History page review indexing history for this source (see What Information Is Displayed in the Index History?). 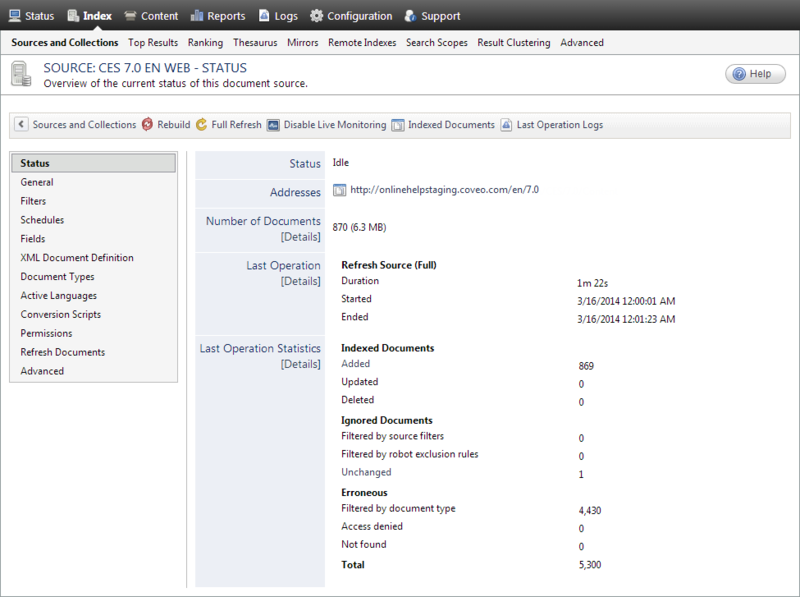 Displays a count of documents waiting to be converted and list documents currently being converted. Example: A File connector source is converting documents.